Click on the big red “play” arrows to listen to a sound clip. The Gathering / Gather 2001 The Gathering: Movement 1 of 3 from Miniatures of Kin: words by Janie Gardner Cunningham; music by Julie Gardner Bray. I Enjoy Being a Dyke [Girl] 2001 Words by Oscar Hammerstein II, with additional words by Ruth Clark and Loraine Edwalds. Music by Richard Rodgers. Williamson Music Co. Please provide your email address and, if you'd like, your street address, too. You'll be able to unsubscribe at any time. Background photos from: 12th Sister Singers Network, Grand Rapids, June 2018. Lois McCullen Parr (ferns). 11th Sister Singers Network Festival, Champaign-Urbana, July 2014, Photographer Jay Schubert. Photo of A Midwinter Night’s Journey, December 2013 by Danyel Duncan. Family of Friends design by Sue Dunmore. 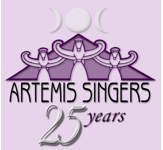 Copyright © 2018 by Artemis Singers. All Rights Reserved.